Since we launched our first customer website over 10 years ago, we have developed many websites and worked with a huge number of people across many business sectors. Below is a small selection of the websites we have built for local businesses like yours. 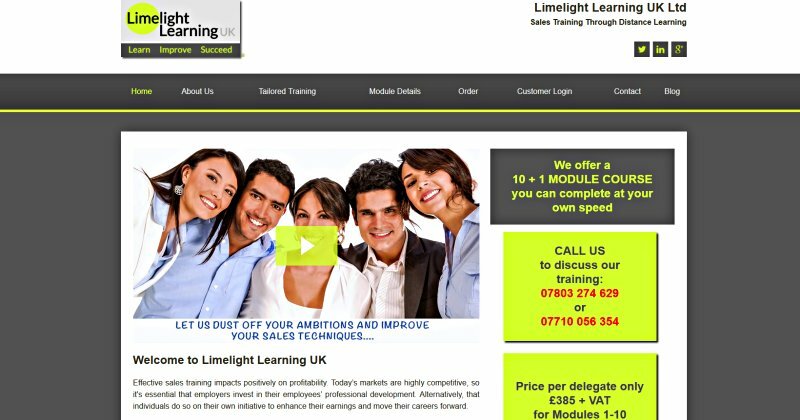 The project for creating an Online accessible module-based sales training course came in two parts - the website and the modules themselves. We created a mobile-responsive website which features a bespoke admin section to control customer logins and access to the sales training modules. The home page features an embedded video using a professional video hosting service, which can be customised to match the website colours, and there are subtle animations and transitions as you scroll down the page or click on links. We needed to come up with a way to illustrate the otherwise dry .pdf modules in a unique and memorable way, so we came up with the caveman mascot to reflect a key element of the training course, which spells out the word 'CAVE'. 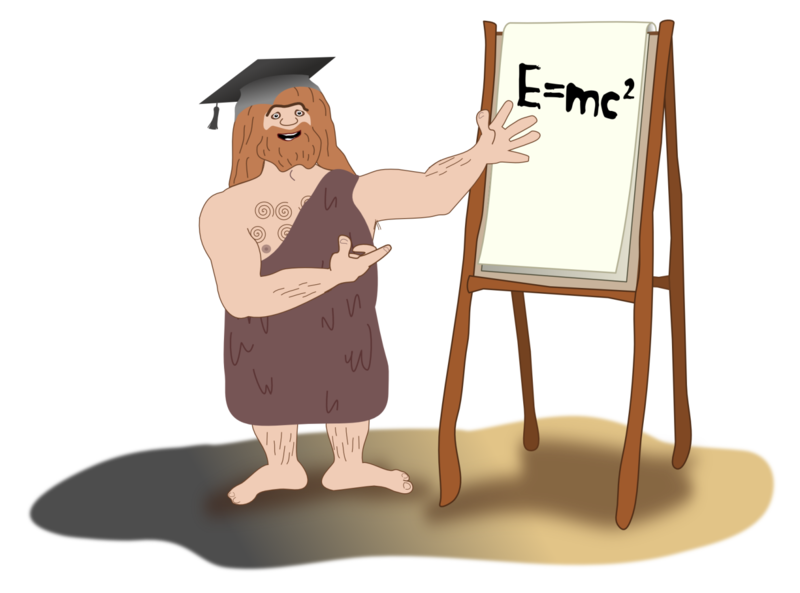 Original cartoons of cavepeople in various situations were created - these may only be seen when you purchase the training course modules. We created this striking website for Pixie, a young and energetic children's entertainer, who makes appearances at children's parties in the guise of both Pixie and Princess Candy Belles (though not at the same time)! Pixie already had an idea of how she'd like her site to look, presenting us with a detailed mood board, and also asked if we could come up with a cartoon Pixie character. She was extremely happy the site and her cartoon 'Pixie', which has received many positive comments. This website is mobile responsive, featuring subtle animation effects, a testimonial page, where comments are approved by Pixie before automatically being published to the website, and a photo gallery page to which Pixie is able to add photos herself. Skyex is one of West London's largest minicab companies, established for over twenty years and is a very busy site. Aiming to attract more corporate clients to their executive car service, Skyex approached us with an urgent request to redesign their website at quite short notice to coincide with a poster advertising campaign. Due to the nature of the business, it was essential to ensure the site was accessible on mobile devices from the start, and we were able to successfully launch a fully mobile responsive site on time. Lola is a foot health practitioner, and needed a logo and a website to promote her business. She had a very clear idea of the type of site and logo she had in mind. Using the requested colour pallette, we created a site with a 'medical' feel, sourcing appropriate stock images which suggest foot health, rather than cosmetic pedicures. 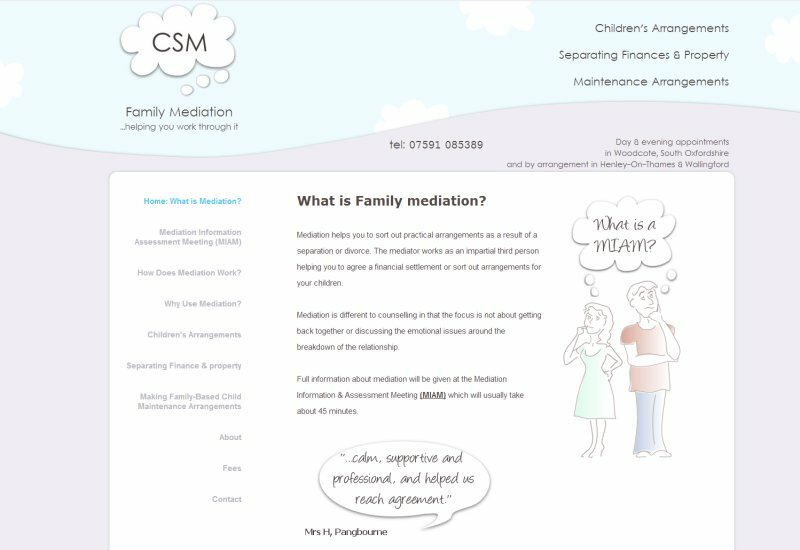 Aideen Mattimore is an accredited family mediator, and she wanted a website which would give a sense of calm and professionalism, whilst giving a nod to the fact that she often deals with children. Following Aideen's lead to use very subtle greys and blues, we created a site which features child-like clouds and line-drawings, to soften the serious subject matter. 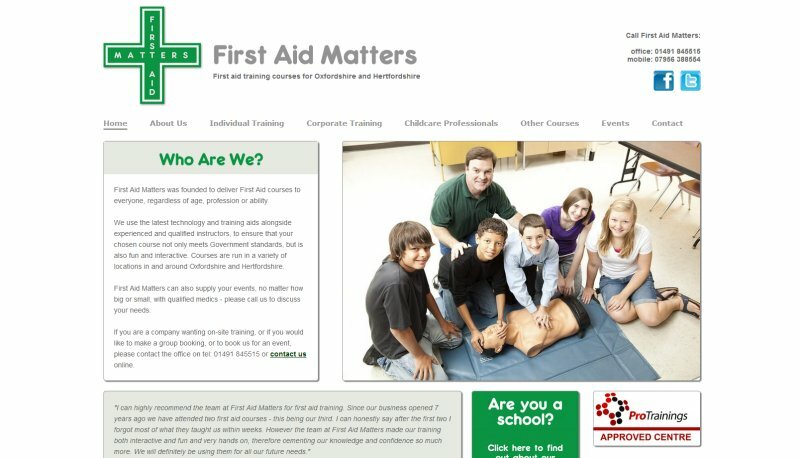 First Aid Matters already had a website and logo, but were looking to modernise, and be able to provide up-to-date first aid course information which First Aid Matters Trainers were entering on www.procourses.co.uk. We wrote a script in order to fetch information from www.procourses.co.uk every day - this automatically updates the courses displayed on First Aid Matters, without information needing to be input twice. Thus, the First Aid Matters website can show the most up-to-date information seamlessly. Award-winning Children's Entertainer, "Jelly" Kelly Cummins has been making birthday's special for children for many years with her magic shows, balloon twisting antics, party games and entourage of stuffed companions. Her site is incredibly busy as it is full of photographs from previous parties, games provided by her father for children to play, party gifts, jokes and hundreds of feedback entries and even hand-written testimonials from her many young fans. Jelly Kelly's website is a complex design and makes use of many modern HTML5 & CSS3 features to create its multi-layered backdrops, floating balloons & transparency effects. The official website of Min-Jung Kym, an extremely talented British classical pianist. The site opens with a looping audio excerpt taken from Mozart's Piano Concerto No. 21. beautifully performed by Min Jung Kym. The homepage also features randomised, scrolling quotations from previously published articles and links to Min-Jung's reviews. Her website features HTML5 Embedded Audio, a dynamic Reviews section, a gorgeous photo gallery and multi-lingual user-maintanable content. 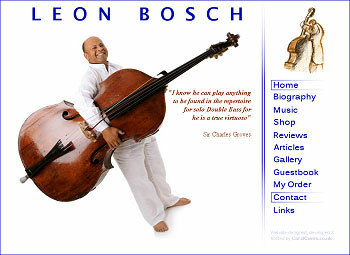 Leon Bosch is recognised as one of the world's most influential virtuoso Double Bass players, and his website is a comprehensive collection of articles about his life and reviews of his music. There is also a gallery of photos, a complete discography, and all of Leon's latest CDs may be purchased from the Paypal-enabled online shop. The homepage features an excerpt of Leon's music, which automatically plays when you enter the site, and there are further audio clips on the music page, showcasing the highlights of each of his most recent CDs. Leon's site also contains a guestbook, which allows friends and fans to leave comments. Visitors making comments need to enter an automatically generated number image, which protects the guestbook from automated spam. 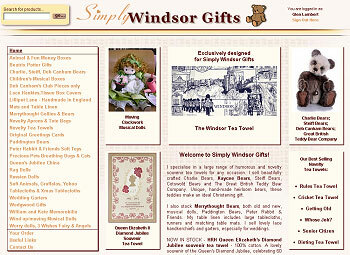 This is the online presence of a well-established concession in Windsor Royal Shopping Arcade, Windsor, Berkshire, and specialises in novelty and humorous tea towels, Heirloom teddies, Charlie Bears, lace handkerchiefs and table linen. The online shop features the option of adding a 'gift message' with an order, if you are sending it directly to the recipient. You may also choose to reserve and then collect items from the concession, rather than having them delivered. This option is particularly useful for heavier items, or for customers who know they will be visiting Windsor and prefer not to pay for postage. Blacklock's, based in Englefield Green, is an antiquarian bookshop with the unusual speciality of polo prints and polo books. 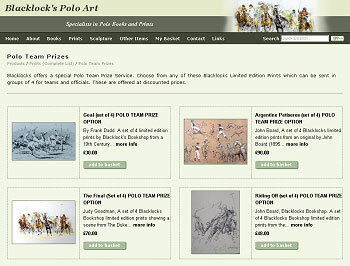 We created the Blacklocks Polo Art website with this speciality in mind. The Paypal-enabled shop features SMS notifications to the owners when an order is placed, which helps to improve response times to online orders. As with our other shops, Blacklock's is able to select their own postage prices using our very flexible admin system, which may be configured in various different ways within a price matrix. Postage costs can be specified based on geographical area, so that packages being sent within the UK would have a lower postage cost than packages going overseas. 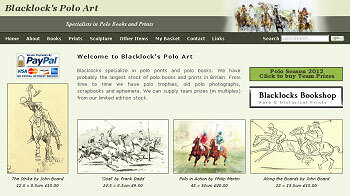 Indeed, Blacklock's Polo Art frequently receives orders from overseas, something which would not have been possible without an online presence. We are very pleased to note that our promotion of this niche selection of products using our thorough knowledge of SEO, has meant that Blacklock's consistently appears at the very top of searches for 'polo prints' and 'polo books'.